All the objects that go up for auction at Christie’s Auction House are placed on exhibition, and those exhibitions are open daily for the public to visit, free of charge. You’ll see a wide variety of art, jewelry, and furnishings, most of which come from private collections and have rarely been seen in public. See a list of current and up-coming collections on display. Christie’s a Rockefeller Center has three floors of auction galleries on public exhibit. It’s like an ever-changing free museum gallery, where the items are available for purchase if you have enough money. As this a Traveler article on the auction house suggests, Christie’s is “a museum with a thrilling twist, the world-class art you’re admiring can also be yours to own.” (If you decide you want to bid on something, see one of the auction house attendants about registering). General hours are 10:00 a.m. to 5:00 p.m. Monday – Saturday and 1:00 p.m. to 5:00 p.m. Sunday. See Christie’s viewings list to confirm times. Christie’s Street view. Use the arrows and compass to scroll. 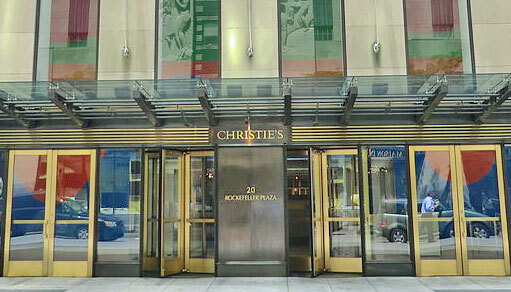 Christie’s is located in Rockefeller Plaza. Stop by while you’re visiting other Rockefeller Center attractions. It’s right there near the Rockefeller Plaza studios, the fountain, and the Top of the Rock. The address is 20 Rockefeller Plaza. See and Own a Piece of History at a High-End Auction House – Excellent article about visiting Christie’s in NYC. Appeared in November 21, 2016 edition of Traveler. TripAdvisor – Read reviews and comments from fellow travelers who have visited Christie’s Auction House.